One of the more consistent knocks against the HTC Evo, the Android-powered phone I've been using every day since my switch from iPhone is that it's battery isn't fantastic. Some found it so poor as to completely recommend against buying it, despite all the other features it does have which make it one of the more intriguing smartphones to debut in 2010. Just behind the concerns about its battery? Issues with its size - leading some to say it's just too big, mocking it with comparison's to Gordon Gekko's cell phone in the epic 1980s film Wall Street. I have found a battery which really does let the Evo go all day. But guess what? It actually makes the phone even thicker, meaning for a few more hours of talk time, you're jamming a phone reminiscent of the size of a Sony PSP into your belt holster. 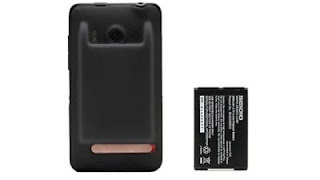 For just over $60, you can purchase a battery designed for the HTC Evo, from Seidio, called the Innocell 3500 mAh Extended Life Battery for HTC EVO 4G. The standard battery for Evo is 1500 mAh, so it's no surprise the larger battery gives the phone a lot more power for a lot longer. Somewhat nervous about the bulk of the device, but more curious about how long I could use the phone, I had to get one. (Remember, no battery is good enough) While previously, I had scared up a full day's worth of use of the phone while running the stock Android UI, the return of HTC Sense following an OTA update in 2.1, and continued Sense through 2.2, has drained the capability of the device, forcing me to be around chargers all day. Most Evo owners have perfected the art form of avoiding draining the phone's battery, or have just resigned themselves to being plugged in often. Having the new battery means this is no longer an issue. 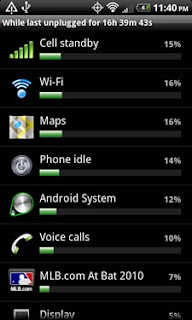 A battery's capacity seems to flow downhill. Once out of the full "green" state, it isn't too long until an Evo battery can get to half-full, less than half full, and start to go amber, followed by red, and periodic warnings of low battery at 15% and 10% capacity. But with the Seidio battery, green lasts a very long time, and I don't have to think about micromanaging my own use. The first day I used the battery, it easily went the full 17 or so hours I had it active, before settling in for the night, and I don't chase power outlets any more. I don't worry about lengthy phone calls, or tapping in to Advanced Task Killer to reduce drain. The thicker Evo is amusing. The new battery comes with a specialized case that replaces the standard Evo backing. Take the old one off and put the new one on, and you can easily see it's both thicker and heavier, even though it surprisingly feels good in the hand when using to talk, or when turned horizontally to send e-mail, browse the Web, play videos or games. After using the Evo when I first got the device, it made my old iPhone 3G feel like a cheap toy. Add this battery in the mix, with its extra heft and thickness, and it reinforces that feeling of brute strength. You may not win any fashion awards with this backside growth, but the availability of all-day power cannot be overstated. I'll take the extra ounce for all-day access.